The body is a complex and amazing mechanism, with each of its systems, cells and atoms in constant communication. Unfortunately, the stresses of everyday life can compromise these lines of communications or overload the energy circuits. To address this, the BodyTalk System provides a simple and effective form of therapy that allows the body’s systems to be re-synchronized so they can operate as nature intended – and effectively respond to injury and illness. 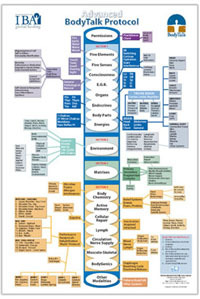 The BodyTalk System works by first identifying the weakened energy circuits within the body. The practitioner relies on the body’s inherent knowledge of itself to locate the energy circuits that need repair by using a form of biofeedback, which is a subtle muscle-testing technique. For every malfunctioning energy circuit found, the practitioner or client contacts the corresponding “points” with his or her hands. The practitioner then lightly taps the client on the top of the head, which stimulates the brain center and causes the brain to re-evaluate the state of the body’s health. The result is that the general energy balance of the body is greatly improved. The practitioner then taps the client on the sternum to “announce” the corrected energy flows to the rest of the body. This is beneficial because the heart is responsible for communicating the state of the body’s health to the rest of the body. Stimulating the heart by tapping the sternum forces the heart to store the corrected energy patterns in the body’s cellular memory. This means that the body will remember these changes after the treatment. The BodyTalk treatment protocol is straightforward and requires no diagnoses. The practitioner relies on the guidance of the body’s natural wisdom to not only locate the weakened lines of communication but also to find the proper order in which they are to be addressed. Just as the body heals a wound with a particular sequence of chemical reactions, the body wants to address all healing in a certain order. This concept is paramount in the balancing process to initiate the body’s ability to heal itself. The healing process usually follows rather quickly.